Open Carry is a somewhat controversial topic, but one thing nearly everyone will agree on: You need a second level of Retention if open carry is going to be a habit for you. A second level of retention is a step that requires deliberate manipulation to draw the pistol, aside from the passive retention that should already be built in. Our holsters are molded specifically for the exact firearm you have (providing retention in and of itself), as well as adjustable retention held in the trigger guard. 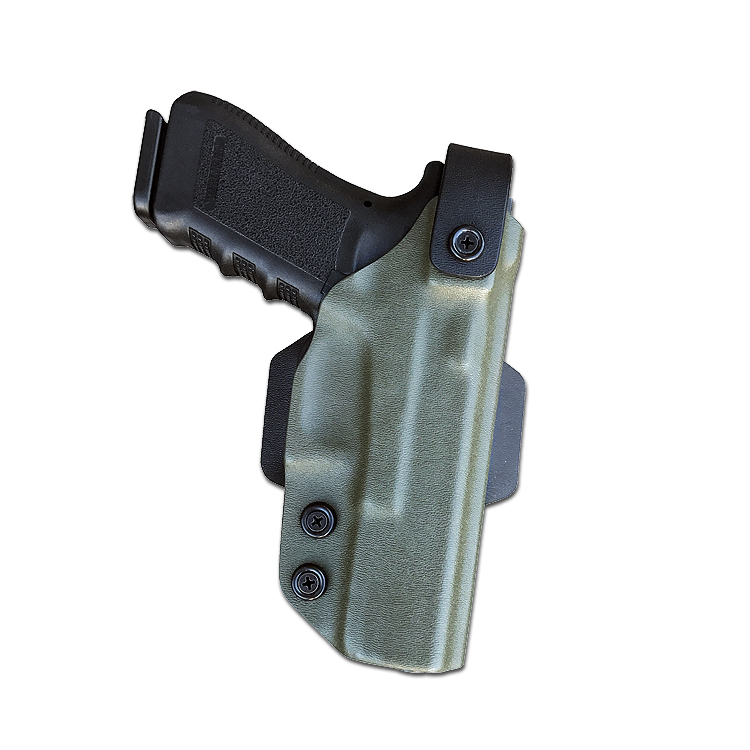 Our Level 2 Holsters also have a manually operated rotating hood as the second level of retention. This hood operates in a way similar to that of a tight operating safety on an AR 15 variant rifle, it clicks in and out of place due to a molded detent. As you can see in the pictures above, our Level 2 Retention Holster design is very simple. This holster will not hinder you from being able to draw quickly, should you need to. It will, however, hinder someone else from taking your firearm in a bad situation. If you have a light or laser on your carry gun, you'll need to check out the Light bearing Level 2 Holster. For more information regarding our Level 2 Retention Holsters, please don't hesitate to contact us via e-mail!